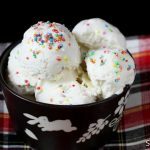 Ice cream recipe without Icecream maker – Learn how to make ice cream at home with video and step by step photos. 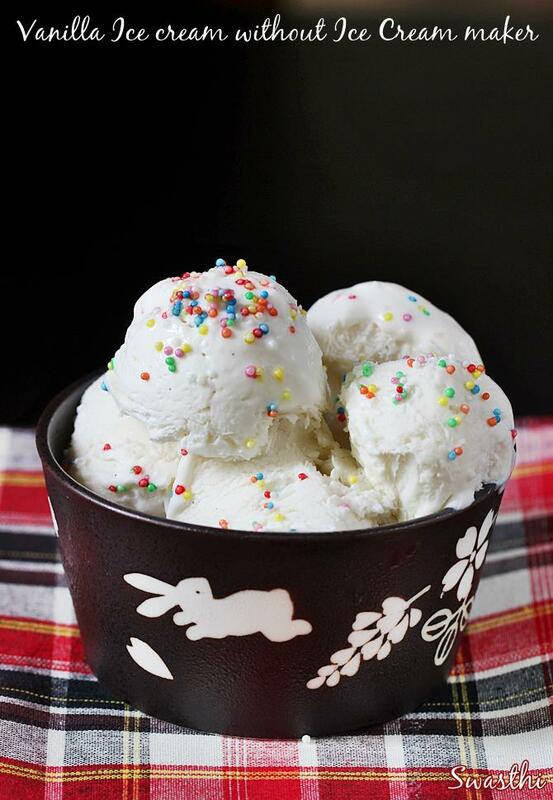 These super easy recipes will yield delicious and creamy homemade ice cream,all without the use of a Icecream maker. I am sharing 2 recipes, depending on your choice of ingredients you may choose any. But both yield delicious ice cream with absolutely no ice crystals formed. The quantity of cream used here is high as it helps to prevent the ice crystals and yield smooth and creamy icecream without having to blend or whip them multiple times. They can be made with cream that has at least 25% fat. So Amul fresh cream, milky mist or any whipping cream or heavy cream can be used. You can also check these Ice cream recipes. You can watch this short video of about 1 minute which I made using the first recipe in this post. 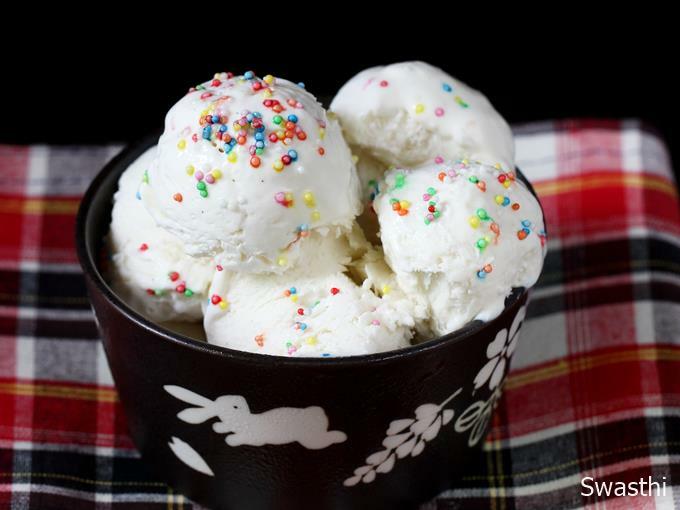 Quick and easy homemade ice cream without a Icecream machine. 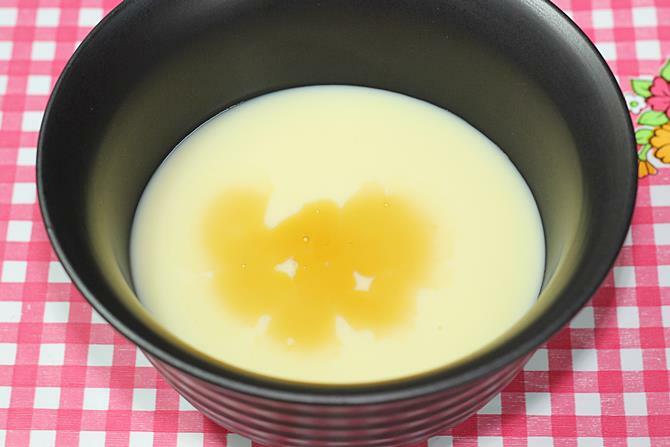 Chill the cream & condensed milk over night in the fridge. Chill the bowl and beaters at least for 24 hours in the freezer. 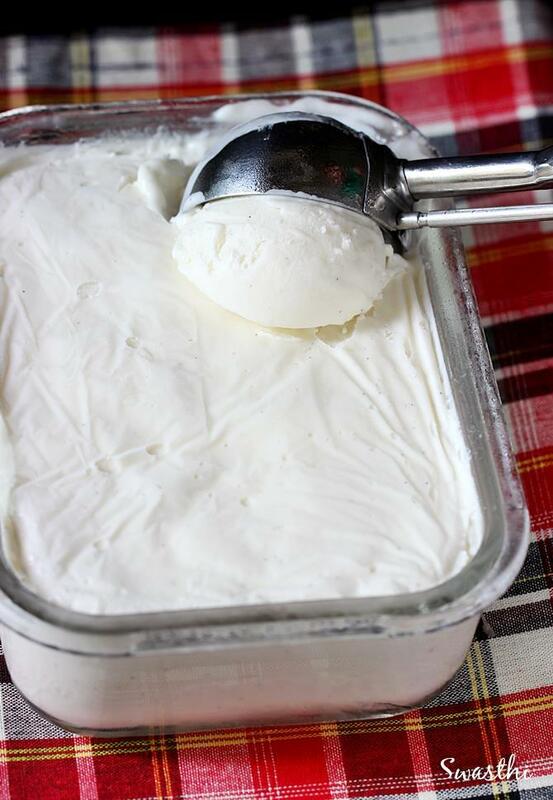 Pour the chilled cream to the chilled bowl. Begin to whip on a low speed first. Then increase the speed to medium. Whip it till you see stiff peaks. Do not over whip the cream as it can turn grainy. Pour the condensed milk and vanilla. Then stir gently with out deflating the cream. Transfer this to a box and freeze for 8 to 15 hours. Scoop the ice cream and serve. 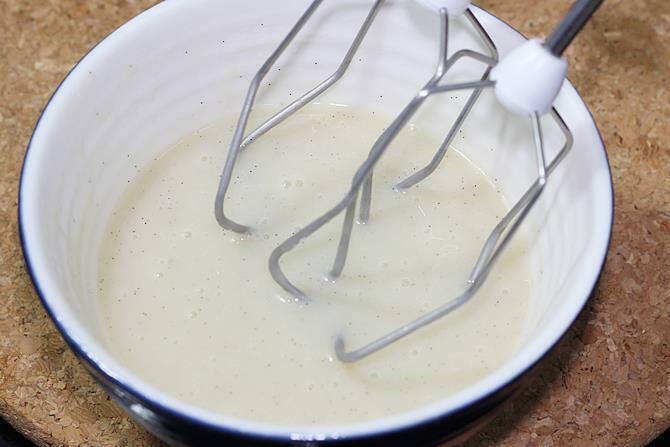 In a pan whisk together corn starch or custard powder, vanilla pod, sugar and milk until the sugar dissolves. 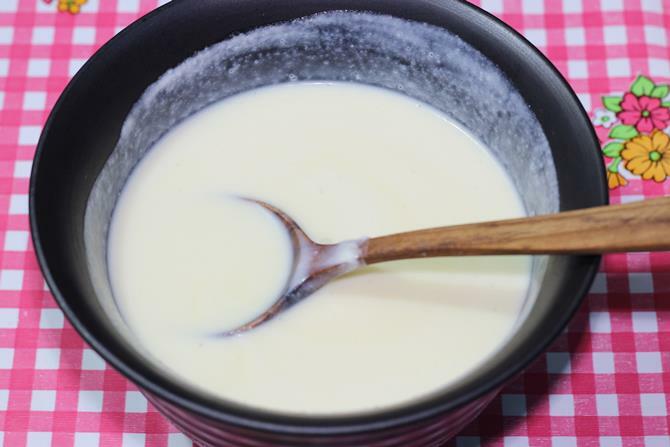 Cook this on a medium heat stirring constantly until the custard thickens and coats the back of a spoon well. Do not over cook. Filter this. Cool and chill in the fridge. Beat with the electric beater. 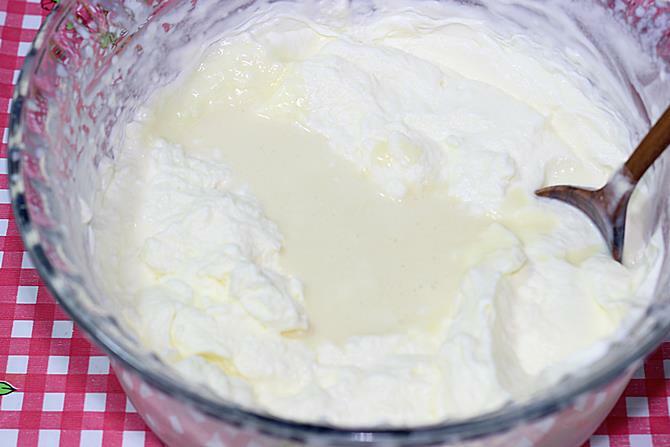 Whip the cream in the chilled bowl until stiff peaks are formed. 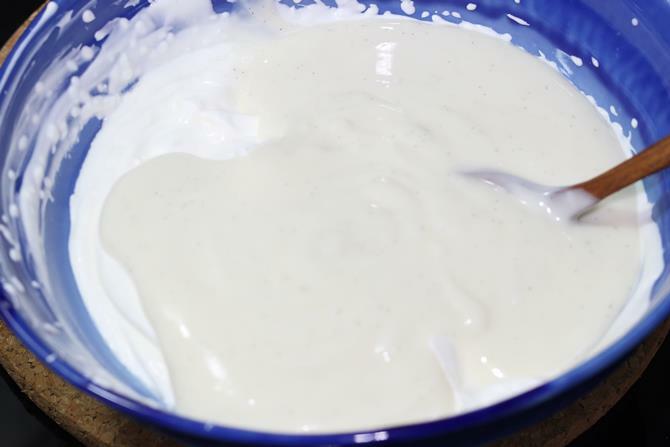 Add 2 scoops of this cream to the custard and stir well. Pour this back to the whipped cream. Stir gently for even mixing. Pour this to a freezer safe box. Place a cling wrap over the cream. Freeze for 8 to 16 hours. 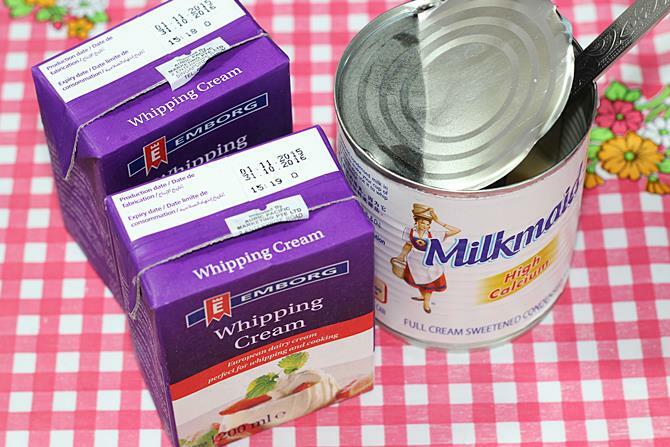 For every 1/3 amount of condensed milk tin, you will need 200 ml cream. So for 2/3 rd amount of the condensed milk , you will need 400 ml cream. If you like to use up the entire tin, then use 600 ml cream. 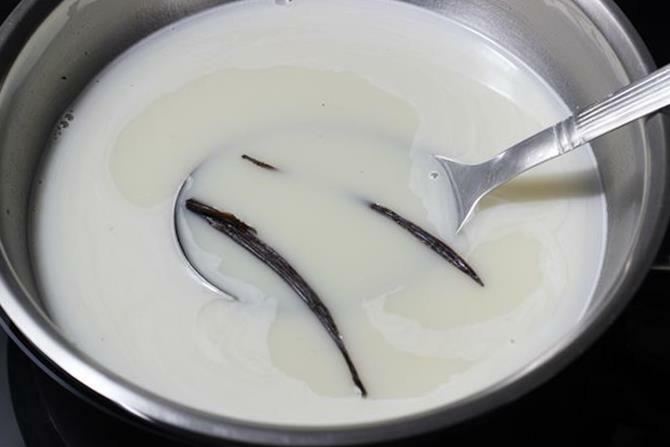 You can use vanilla extract to suit your preference. 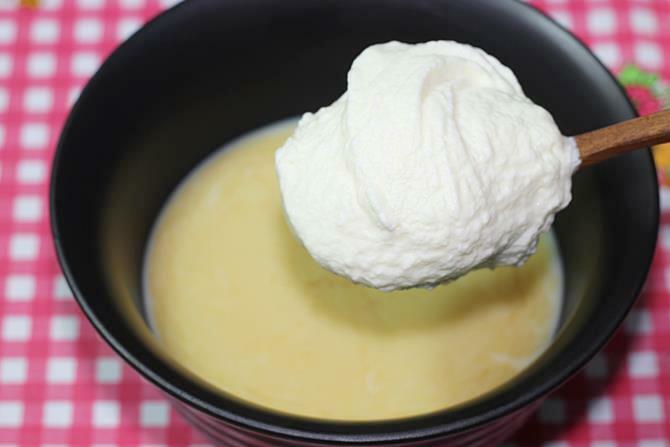 For this recipe, we need only 3 ingredients – Condensed milk, cream and vanilla extract. 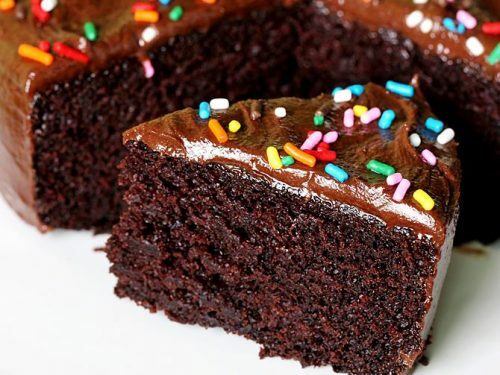 As i mentioned above, this can be made with any cream having at least 25% to 40% fat. In the past i have tried this with amul cream and milky mist, they work well too. 1. Begin with chilling the bowl and beaters overnight in the freezer. 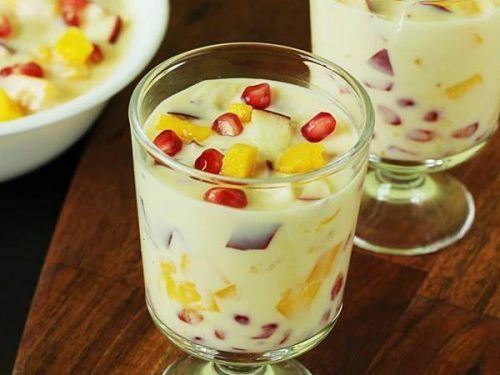 You will have to chill the cream and condensed milk in the fridge and not in refrigerator. 2. 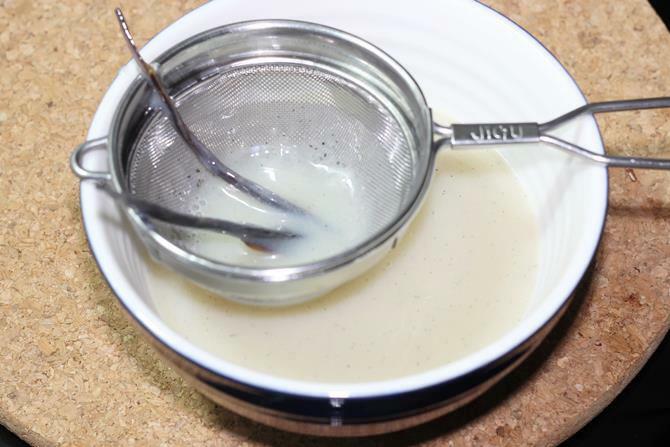 Transfer the condensed milk to a mixing bowl and then add vanilla extract. Set this aside. 3. 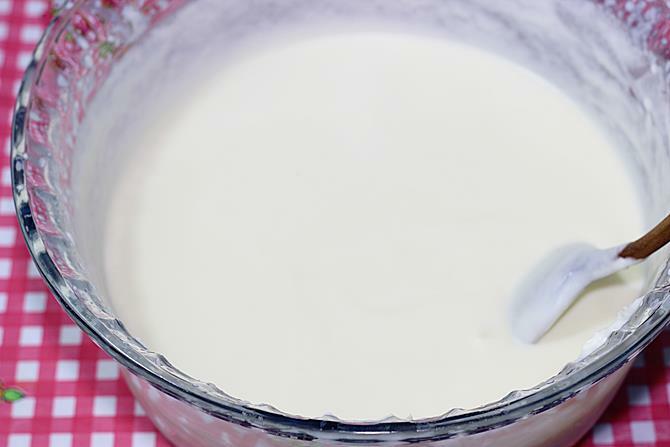 Pour the chilled cream to the chilled bowl. 4. 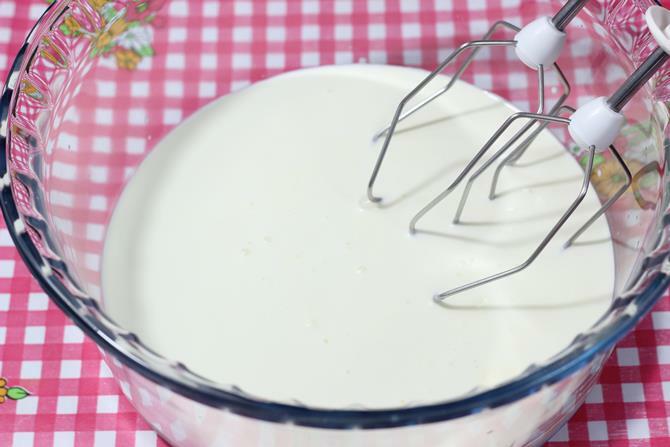 Begin to whip with a electric beater or a stand mixer or hand mixer. 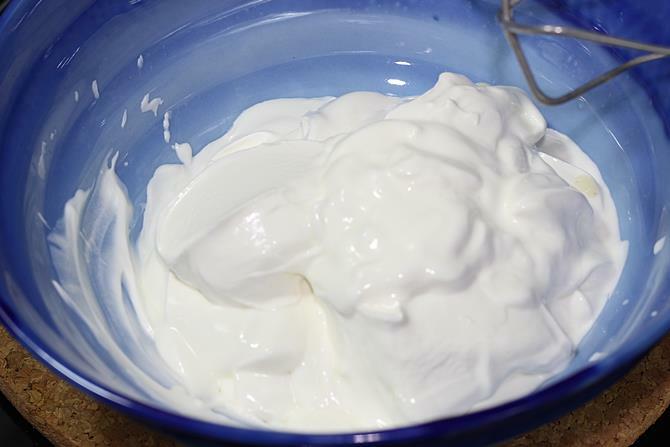 Whip until soft or stiff peaks depending on your cream. 5. Add 1 to 2 scoops of this to the condensed milk. 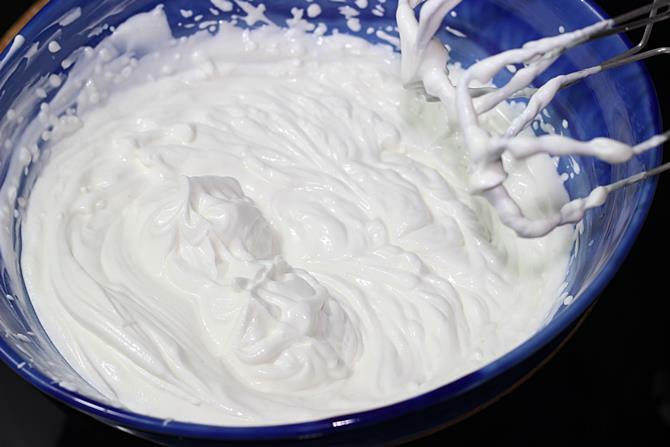 You can also add condensed milk directly to whipped cream. But i prefer to do it this way just as a precaution not to end up deflating the cream. 6. Stir it gently for uniform mixing. 7. Pour that to the whipped cream. 8. Gently stir for uniform mixing without deflating the whipped cream much. 9. Transfer this to a freezer safe container or box. Place a cling wrap or a food grade plastic sheet over the mixture. It must touch the cream. This helps to prevent ice crystals. I hate to use plastic for the food, but not sure if it works without the plastic wrap. Cover the box and freeze for at least 8 hours. After 10 hours it was hard, so I left it out for about 10 mins before serving. This stays good for about 10 to 12 days. At 30 degrees C, It began to melt after 15 mins of taking it out from the freezer. If you are making it for a party, then you can scoop them to ramekins and freeze them up to an hour before serving. 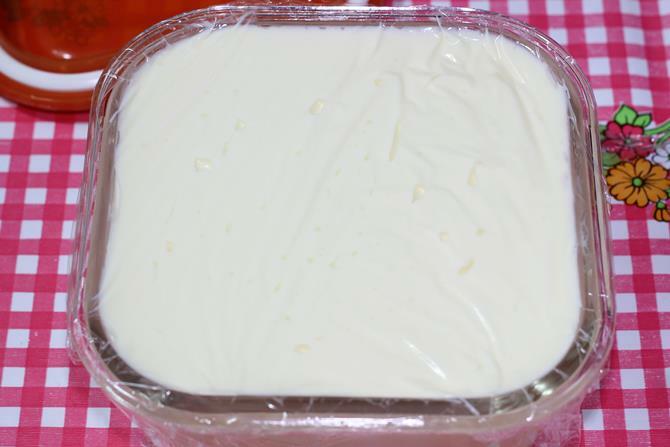 This is a custard base icecream made with corn starch or corn flour, milk, sugar and cream. 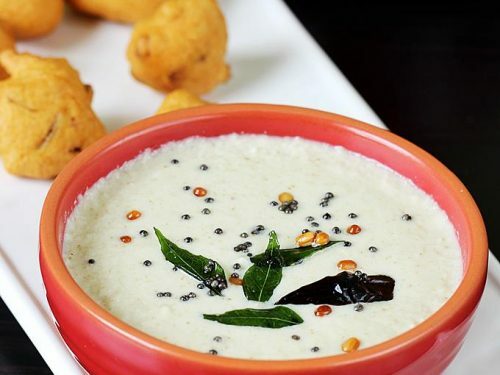 You can also use custard powder instead of corn flour. If you follow the recipe exactly you don’t need to blend it after the initial freezing. You can serve it right away once it is set. But if you Over freeze it, you will need to whip it or break the ice crystals and then freeze back until set. I highly suggest using a very good pure vanilla extract or vanilla bean for this. You can also use 2 to 4 tbsps of condensed milk or milk powder to this to add flavor and subside the dominating taste of corn starch. Any recipe that uses corn starch will surely have a flavor and taste of it unless there are a lot of additives added to it like in the commercial ones. If you are trying to replicate the commercial Icecreams then i highly recommend making this with condensed milk or milk powder. 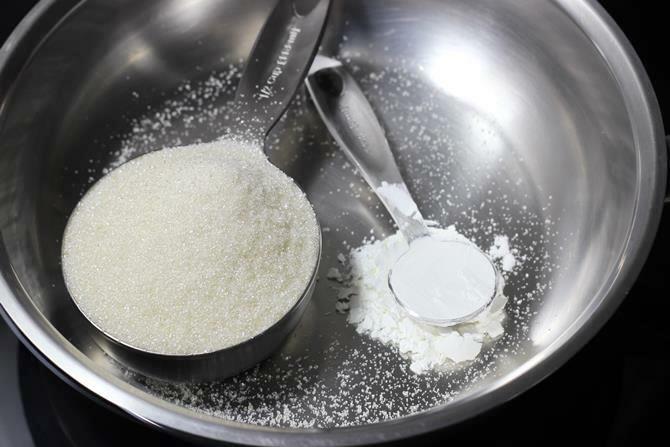 With that you will need to reduce 2 tbsps of sugar in the recipe. 1. For this recipe, we will be using 2 tsps corn flour or custard powder, ¾ cup of sugar, vanilla pod or 2 tsps pure extract, ¾ cup (180 ml) of full fat milk & 1 ½ cups or 360 ml of cream with 25% to 40% fat. 2. Add sugar and corn starch to a pan. 3. Add milk and vanilla pod if using. You can either use the vanilla pod or vanilla extract. Pod gives a deeper flavor since it is simmered in the custard for a while. But it discolors the custard leaving tiny black speckles in it. If using extract, add it later. Stir very well until the sugar melts off. Make sure the mixture is uniform and lump free. Begin to cook on a medium to low flame stirring constantly. Do not bring it to a rapid boil. Cook it stirring constantly until it thickens slightly. 4. 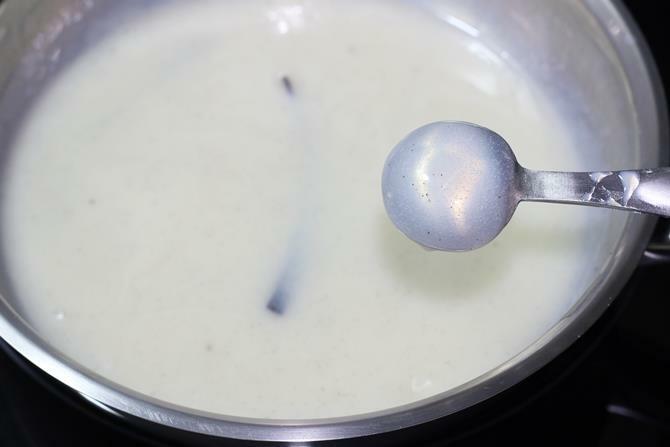 The right way to check the custard: When you dip the back portion of the spoon in the custard, a thin layer must form on the spoon. Overcooking the corn starch will make the ice cream taste floury or like corn starch. 5. Filter it and cool completely. Chill in the fridge for sometime. 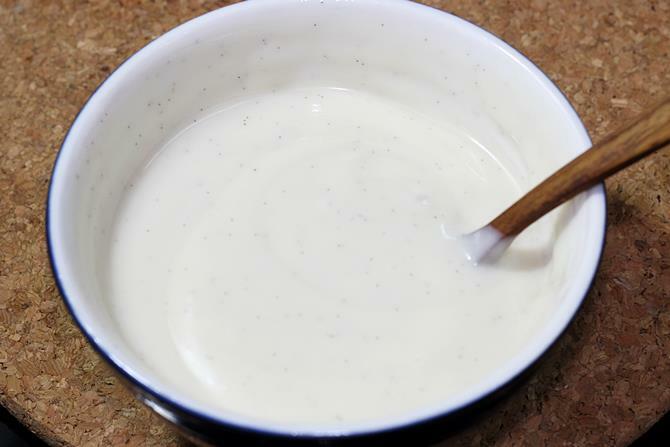 The color of the custard is not white here due to the addition of vanilla pod. 6. Beat with the hand held beater for 1 to 2 mins. Set this aside. 7. I have used amul fresh cream here. I chilled it overnight. Then i scooped out the top portion. 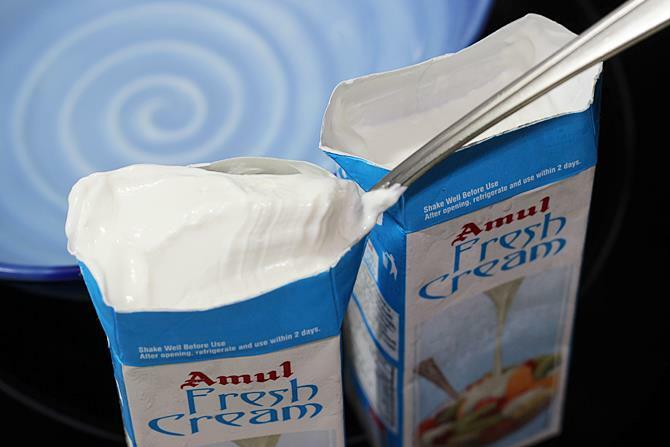 2 packs (200 ml) of amul cream yielded me about 1 ½ cups or 360 ml of cream. I was left with 2 to 3 tbsp of whey in the pack which i have discarded. If you are using cream with 35% or more fat, you can use up the entire content from the pack. 8. Add the cream to the mixing bowl. 9. Whip until peaks are formed. With amul cream, you will get only soft peaks. 10. Take 2 scoops of the whipped cream and add to the cornflour custard. 11. Gently mix it well. 12. Pour this to the whipped cream. 13. Gently stir for uniform mixing. 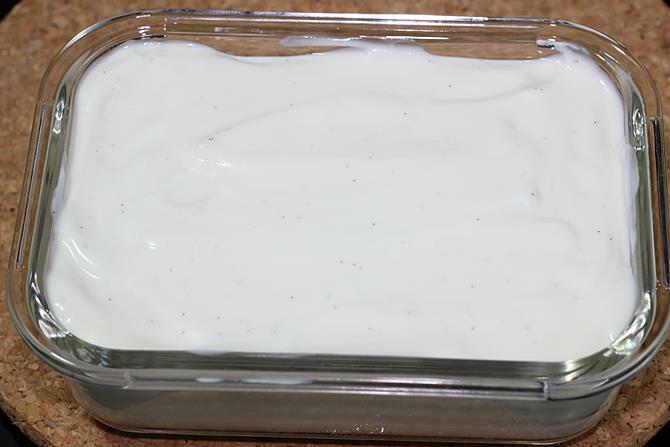 Smooth and delicious ice cream mixture is ready. 14. Transfer this to a freezer safe box. Place a cling wrap on the ice cream. Cover and freeze for overnight. 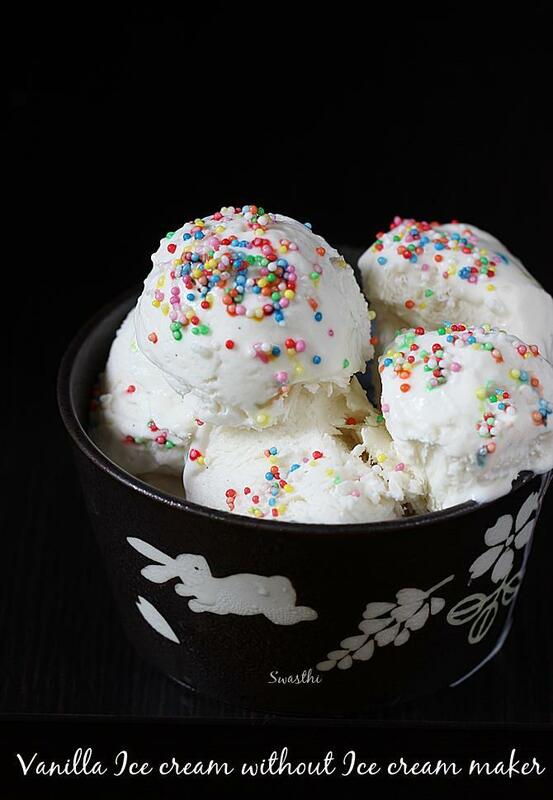 Scoop vanilla ice cream and serve immediately. Where can I get the toppings for ur ice creams? Without milk cream there is no way to make ice cream, at least some sort of cream like coconut cream etc is needed. 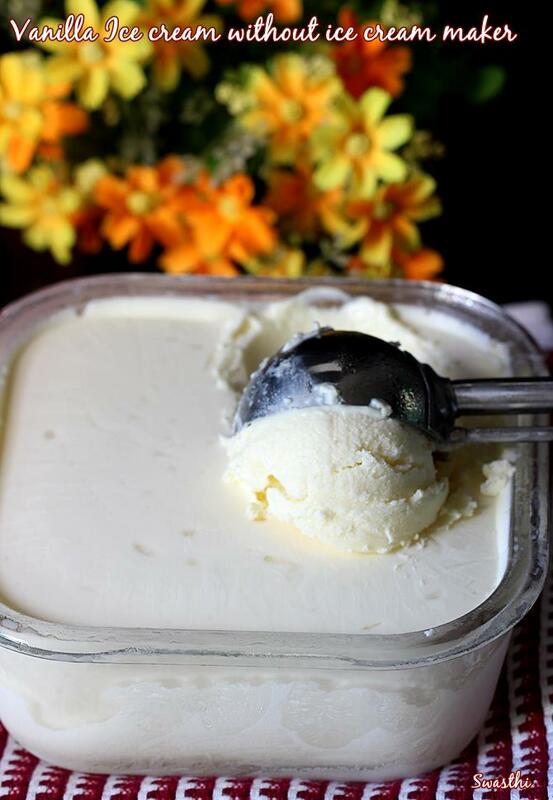 I suggest you try kulfi ice cream, it tastes delicious and can be made without cream. You can serve it like ice cream if you do not have cups to make popsicles. Yes milky mist is great even for cake toppings & ice creams. You will get stiff peaks and remains stable if it is not very hot. May be you should avoid during summers, but I have used it many times. 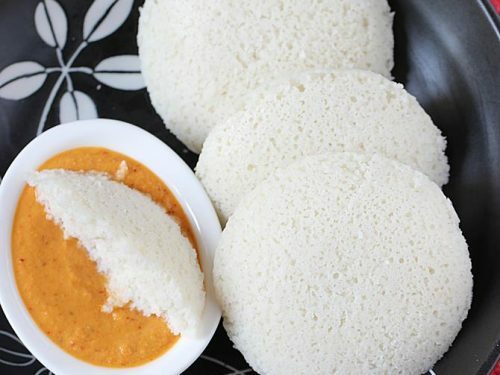 It is the one with highest amount of fats that is sold in India. 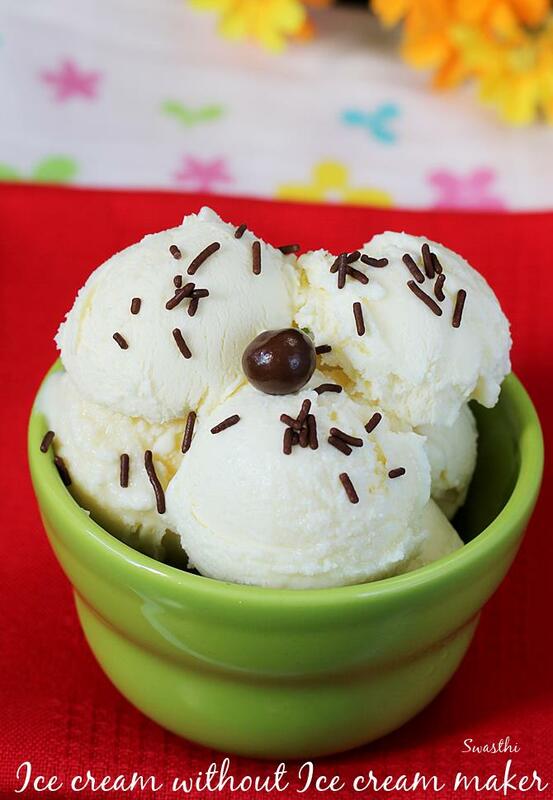 I have even shared some ice cream posts using milky mist. You can take your time to share the recipes. Thanks a lot. 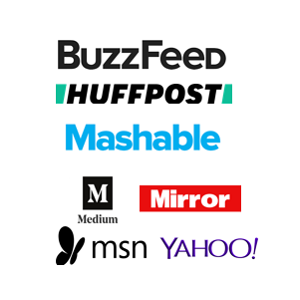 Urs is the best blog as u mention the cup size n yeild for every recipe…..u respond quickly too…..ive bookmarked most of ur recipes…….try to create an app for mobiles. 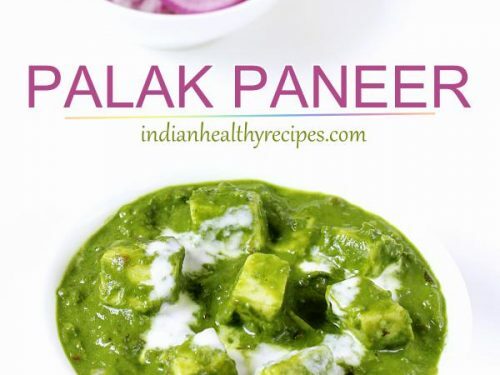 I’d like to share few recipes with u…..where shud i post them. I am good. Thanks for asking. Hope your kids are doing well. I have been trying my best for the app, but due to time constraints we are unable to launch it. A lot of effort & time goes to maintain it later. I am the only one to work on this blog, so don’t think I will be able to do it. I do not suggest non dairy whipping cream as they have lot more additives than the dairy cream. Tropolite comes with lot of emulsifiers and thickeners in the E series which are unhealthy. More over it is made of vegetable oil. 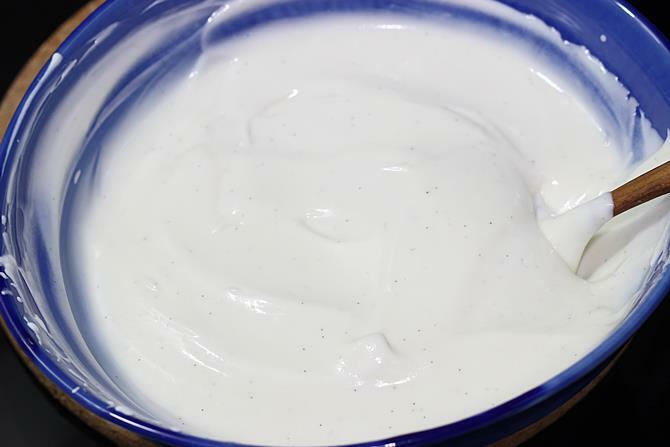 If you live in India try to buy milky mist cream which is completely free from any additives. Yes we should never freeze cream that we plan to whip. The texture turns out different and sometimes even curdles when you begin to whip, sometimes it doesn’t get whipped to peaks. It depends on which brand you use. 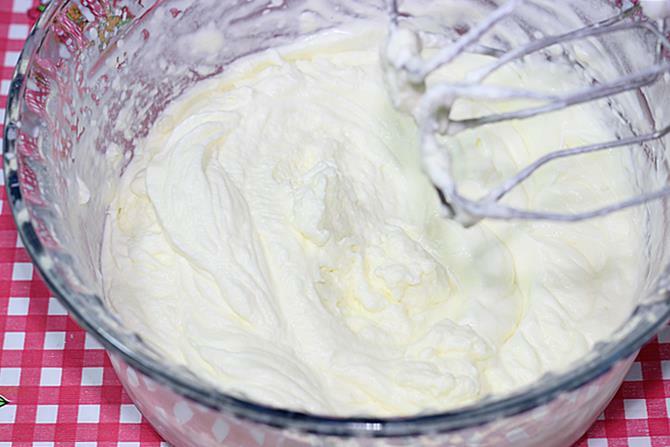 The more additives, more stable it is – when you whip frozen cream. When u say chill cream and condensed milk., do you mean place in refrigerator or in the freezer? Keep it in the refrigerator. Cream should never be put in freezer without whipping. Hope this helps. 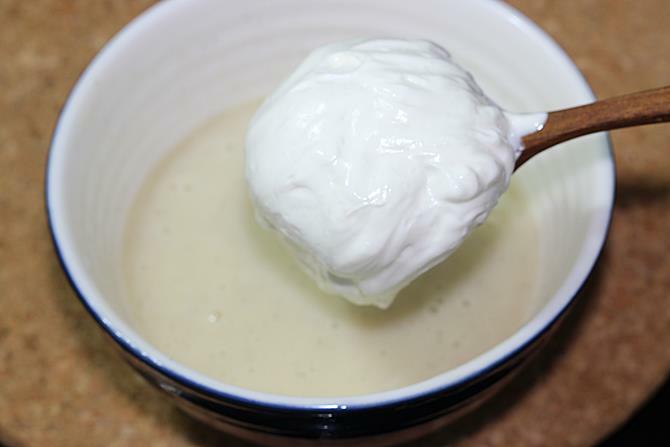 Add the essence to the cream before whipping it. Thanks for following. 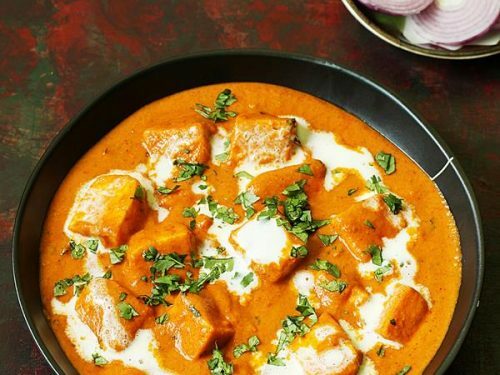 Yes you can use food processor. It does it very well. Use the steel blade and pulse it 5 to 6 times. Then process it just for a minute or two. Do not over do. Thank you Swasthi for your advice,it has made me confident about the recipe and will let you know about outcome once I do It. Another suggestion, Can you please give us healthy recipes (eg. whole wheat cakes, veg chapathi rolls etc). once again thank you for your humble advice. I am sure you will be able to make it very good. Yes sure i will share veg rolls and wheat flour cakes too. Hope you have checked out the bakes on the blog, I have posted some using wheat flour. I am a regular follower of your blog tried them and my family loves it. Thank you so much for following the blog. The blue pack has 25% and red one has about 30% fats. Higher fats in the cream are better. But both will work. you can use any, chill the packs and scoop only the top portion. Refer recipe 2 step by step picture 7. Hope this helps.